This paper presents a discussion of the main issues involved in the Brexit decision and negotiations for Higher Education, Science, Technology and Innovation both for the EU and the UK. It analyses the challenges posed by the results of the British referendum in 2016, providing current data and figures about students, faculty, research and funding and how it might affect the future relations between the EU countries and the UK after 2019. In view of the new avenues opened after Brexit for higher education, research and innovation in the UK and the EU, it also addresses the current conditions and challenges of cooperation between Europe and Latin America and the Caribbean. The author, who is President of a birregional academic initiative, the Academic Permanent Forum for Latin America, Caribbean and the European Union (FAP ALC-UE), offers a summary of the main steps taken by this organization since 2012, which have led to the presentation of proposals to the political summits of Heads of State and Government of CELAC and the EU in Santiago de Chile (2013) and Brussels (2015). This is a grass-root movement constituted by members of universities and research centres in both regions whose main purpose is to put forward proposals for the establishment of a Common Birregional Area for Higher Education, Science, Technology and Innovation. Intractable conflicts are conflicts that persist over a long period of time, resist various attempts of resolution, and present sporadic episodes of violence juxtaposed with periods of relative calm. Also, they contain a large share of psychosocial factors which lend to their uniqueness while also adding to their complexity. The Cypriot conflict is such a conflict. It has been on the agenda of the international community for over four decades, it has gone through a number of occasional violent episodes that fluctuated in frequency and intensity, and has resisted various peace mediation efforts. As a result, the conflicting parties remained locked in an adversarial relationship and fixed in terms of fundamental grievances. This paper aims to explore the interplay of social representations, trauma and victimization in the Cyprus conflict, and their implications on the prospects for its further settlement. Specifically, using discourse analysis as a research method, this paper analyses both the Greek-Cypriot and Turkish-Cypriot official discourse during 1983-2012 in order to see how the two parties represent the conflict, and whether past trauma and victimization influence their social representations. Close attention to the key themes emerging from the two parties’ official discourse helps to deepen understanding of the role and effect social representations, trauma and victimization play in the perpetuation of the Cyprus conflict. This paper is an analysis of the European Union’s policies in the Neighbourhood area at its Eastern border, with a particular focus on the special neighbourhood relations developed with Ukraine. The premises of this paper are built around the idea that Romania, as an EU member state, moving within the European policies for cross-border cooperation and by using the European instruments, develops a legislative and institutional framework meant to deepen this cooperation at its border with Ukraine. The cross-border cooperation between Romania and Ukraine has been marked by the general framework of bilateral relations, but also by the geopolitical context of the two states. Immediately after the fall of communism and the collapse of the USSR, there were difficulties in cooperation between the young Ukrainian state and the Romanian one. The relationship with Ukraine went through a period of mutual mistrust, so that the two countries have started a process of relaxation of their relations, and as a consequence, the EU has been contributing to it, as well. This cooperation has been marked by legislative and institutional changes stemming from a process of normalization and stimulation of relations with Ukraine, due inter alia to Euro-Atlantic integration. The ENP also contributes to this cross-border mechanism through financial instruments, as well as legislative harmonization on both sides of the EU’s external borders. The European Neighbourhood and Partnership Instrument, seen as an incentive in the process of developing relations with the EU’s neighbours, was thus able to create bridges at both political, socio-economic, cultural and cross-border level. The first years after 1989, Romanian public administration seemed not to be influenced by the political changes, in the sense of organisational reform. Only in the eve of Romania’s accession to European Union, and especially since 2000, when the process of negotiation with the EU officially started, the field of public administration began to be in a higher extent considered for reform. From the end of the nineties to the present time it is possible to reveal two stages of changes related to public administration: those provoked from top down, related to the process of accession to EU, and those from bottom up, related to the process of integration in the EU. The main hypothesis of the article is that EU acted as a direct pressure factor / agent of change in what concerns the organisational reform of Romanian public administration realised during the pre-accession period, while it abandoned this direct role after accession (with some negative consequences). 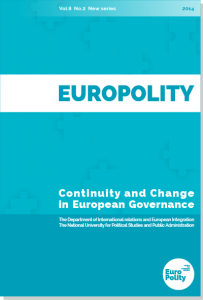 The aim of the present paper is to analyse the dynamic of Europeanisation of Romanian public administration in pre-accession and post-accession periods from the perspective of the organisational reform, realised by adopting the related necessary internal norms according to the Acquis Communautaire. Geopolitics has changed dramatically over the last century, from a modernist discipline focused on the impact of geography on politics and international relations, to a postmodern approach in which traditional assumptions of reality are getting blurred, like the in-out distinction, borders are getting permeable, and state-centrism is replaced by multiplicity. A postmodern actor such as the European Union provides a good example of the sort. The EU has managed to assimilate most of the instruments and policies developed during the course of European integration, including regional policy, or cross-border cooperation, a territorial approach to development across the border regions of Europe pioneered by the Council of Europe since the 1950s. This paper tries to compare the policies of the European Union pre- and post-enlargement regarding Eastern Europe, using a geopolitical approach, questioning whether the recent geopolitical resurgence of Russia has the potential to question the influence of the European Union over its Eastern neighbourhood. The legacy of systematic human rights violations committed during 1999 violent conflict and the previous repressive rule still impact the everyday life of Kosovo citizens. That is why transitional justice processes are a necessary component in Kosovo’s state building efforts. With the end of the 1999 conflict, Kosovo has been administered by the United Nations Mission in Kosovo (UNMIK) and also supported by European Union (EU) presences: the EU Special Representative in Kosovo, and European Union Rule of Law Mission known as EULEX. In the course of implementation of their mandates transitional justice processes were not a priority for UNMIK and EU presences. With the signing of the Stabilization and Association Agreement (SAA) the EU made transitional justice part of the Kosovo accession demands. In December 2015, the Government of Kosovo approved its National Action Plan for the Implementation of the Stabilization and Association Agreement (NAPISAA). The General Principles of the SAA, included within the NAPISAA oblige Kosovo Government to approve a National Transitional Justice Strategy. This paper analyses EU peace and institution-building support and their impact in transitional justice processes in Kosovo. Through analysing the mandate and actions on the ground it draws conclusions if EU is an active participant in transitional justice process in Kosovo or transitional justice policies are promoted by EU only as part of its enlargement strategy. Finally, the paper gives recommendations as a basis for future elaboration of an EU approach to transitional justice. RUSSIAN – UKRAINIAN CONFLICT REVISITED: TOWARDS REGIME CHANGE IN RUSSIA? The “Ukraine crisis”, as it is widely known, or more correctly, Ukraine – Russia war, started in 2013 – 2014, brought potentially devastating consequences for Central and Eastern Europe security and prospective functions of NATO military alliance. Previous Russian aggression, be it in Moldova or Georgia, went unpunished fact that created an impression that Russia had a “blank card” to do whatever it wanted within its “sphere of interests” (i.e. the territory of the former Soviet Union). Fortunately for the countries of NATO’s “Eastern flank” and Scandinavian neighbours of Russia, the West ultimately responded to Moscow’s military actions in the east of Ukraine. Economic and financial sanctions combined with the collapse of fossil fuels price have hit Russian economy and stopped Russia’s involvement in this conflict. For the first time since the dissolution of the Soviet Union, Kremlin has been paying heavy price for its geopolitical manoeuvres. In this article I claim that as a result of Russian actions in Ukraine, this country is approaching “regime change”, though the form of it remains unclear. The West should be prepared for the possible period of uncertainty in Russia, in order to minimize its possible negative consequences: period of social unrest and unknown profile and aims of future rulers of Russia.